On June 4, 1888, NY Gov. 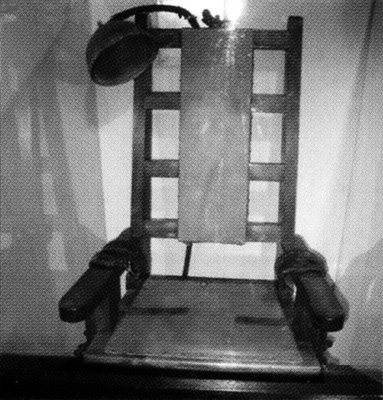 Daniel B. Hill signed a bill authorizing the use of the electric chair. Electrocution was considered a more humane method of execution than hanging. Thus "the chair" replaced "the rope." The hangings had been carried out in the respective counties with relevant jurisdiction in the particular cases. But given the specialized nature of the equipment involved in electrocution, executions by electricity were carried out only at state prisons: first at three -- Auburn, Sing Sing and Dannemora -- but later only at Sing Sing. William Kemmler, the drunken axe-murder of his girlfriend, was the first to be executed by electrocution in NYS. That was August 6 1890 at Auburn. There were 54 other electrocutions at Auburn prison, the last taking palce May 1, 1916 -- Charles Sprague. Sing Sing's chair was first put to use on July 7, 1891, when it executed 4 men for unconnected murders -- first Harris Alonzo Smiler, and then Shibaya Jugiro, James Slocum, and Joseph Wood. Its last execution -- also NYS' last execution -- took place August 15, 1963: Eddie Lee Mays. A total 614 men and women were executed by electric chair at Sing Sing. Based on Daniel Allen Hearn's excellent Legal Executions in New York State 1639 - 1963, the count of electrocutions at Clinton Prison, Dannemora appears to have been an even two dozen. The first was Joseph Wood on August 2, 1892; the last, Frederick Poulin on Feb. 12, 1913. As Mark Gado notes in his Stone Upon Stone: Sing Sing Prison, during the electric chair's era of nearly 75 years, "New York would execute more people than any other state in America during that time and, as such, would become the flagship for capital punishment in the Western world." As described by Guy Cheli, in his "Images of America: Sing Sing Prison, "Executions usually took place at 11 on Thursday nights. Twelve witnesses, along with two doctors, the prison chaplain, the executioner, seven guards, and the warden, were required to be present.